After a four-game winning streak that propelled them to number one in the conference, with an 8-8 record, the Bobcats faced D’Youville College, looking for a second victory. Usually sharp-shooters, the Bobcats didn’t shoot well in the first half, making only 35% of shots. D’Youville was up 45-38 at the end of the first half. During the second half, D’Youville’s offense powered the team to a 16-point win over the Bobcats, 96-80. Pitt-Greensburg’s high-scorer was Jerell Figueroa, who had 19 points and five assists in the game. Marcus Thomas added 15 points and Brian Heinle tallied 11. The Bobcats fell to 8-9 overall. Four days later, the Bobcats were set to face off against Penn State Altoona. After a 89-78 win back in December, the Bobcats were looking for another win on Penn State’s home court. The game was close early on, but the Bobcats took a commanding lead at the end of the second half, leading by more than 20 points. The halftime score was 38-19 for the Bobcats. 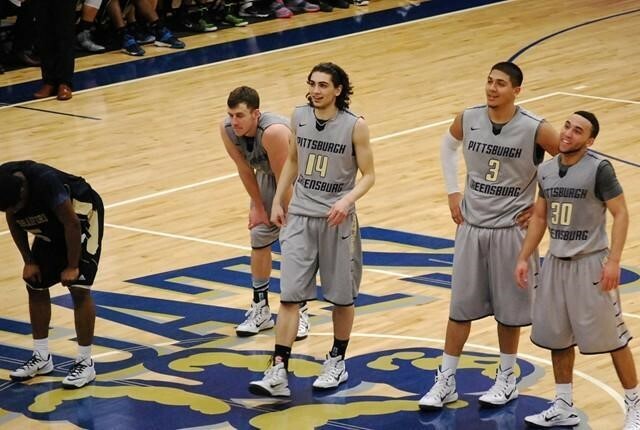 Pitt-Greensburg outplayed Penn State Altoona in the second half, maintaining a double-digit lead. The Bobcats won by 13 points with a final score of 91-78, boosting their record to 9-9 with another conference win. Brian Heinle was the high scorer with 25 points and 3 assists. Marcus Thomas put up 17 points and Rocco Contristano added 14 points in the Bobcat victory. The Bobcats sought another win against the University of Pittsburgh at Bradford three days later on their home court, after a 95-89 win earlier this season. Pitt-Bradford started out with control of the game, but Pitt-Greensburg closed the point gap with six unanswered points for a half time score of 36-35. The second half was fierce with multiple lead changes before Pitt-Greensburg took control at the end. The Bobcats won the game by seven points with a final score of 73-66. Jerell Figueroa, Marcus Thomas, and Rocco Contristano all tallied 17 points for the win. The Bobcats advanced to 10-9 for the season and 10-2 in the conference. The Bobcats remain at the top of the AMCC with a 10-2 conference record. They will have a chance to improve on that even further with six games remaining, all against AMCC opponents. The Bobcats look to hold their current standing and make a playoff run at the end of February.